In the Christian religion, Lent is the approximately six-week period of fasting and penitence before Easter. In my youth, I remember my Catholic friends always “giving something up for Lent,” but the concept of fasting never took root at my house. I wasn’t very good at giving up things I liked, such as pecan pie, ice cream, parties, or movies. The idea of sacrifice completely eluded me. As I grew older, I better understood the idea, yet still I resisted. If I give up chocolate for Lent, how does that benefit or glorify God? I didn’t have the right attitude. Giving up chocolate just made me cranky. I hit on a plan in the early nineties. I decided that instead of giving up some pleasure in my life for Lent, I would give up a bad habit. I was willing to sacrifice a personal failing, a character defect or flaw each year for at least six weeks. This may not be the spirit of what is meant by Lent, but it seemed to me that God would smile on this plan and perhaps appreciate my self-improvement program better than my doing without dessert. I hoped I would end up a better person instead of a thinner one. So the first year, I gave up struggle. The next year, I gave up alcohol. The year after that, I gave up inappropriate men. In the following years I gave up criticism, vanity, complaining, envy, tiredness, stage fright, high heels, smoking. I tried to leave these burdens behind me forever, but shamefaced, I must confess I have returned to pick some of them up again. I am, after all, not St. Chellie. I am a work in progress. Perhaps Lent is not relevant to you—then pick another period of the year in which to do the same thing. Yom Kippur, the New Year, Summer Solstice, your birthday—any day you select can mark the beginning of a six-week period of forging a better self from the ashes of your bad habits. Don’t sacrifice the good things; they will all be laid on the altar of mortality eventually. Sacrifice the little evils, the petty thievery, the unkind comments, panic attacks, despair. Give up jealousy, hatred, racism, profanity, hitting. Live without gossip, off-color remarks, jokes told at another’s expense, fear-based decisions. These are the sacrifices that honor God and your fellow man. If there’s one thing I’ve learned traveling along this life’s highways and byways, is that in all things it is best to completely be yourself. Take a stand for yourself, choose your likes and dislikes, and stand proudly in them. When you are clearly you, other people will see it and know you for who you are. This simplifies life immeasurably. Your People will be drawn to you more quickly, and Not Your People run away far and fast. This is a good thing. You don’t want your life cluttered up with a bunch of people who don’t really like you. It’s too much of a time and energy drain. I was thinking about this as I drove to the Jonathan Club in downtown Los Angeles, to speak to the Los Angeles Chapter of NAWBO (National Association of Women Business Owners). I was dressed in my usual “Give-a-speech-costume”—blouse, blazer, pants and gold tennis shoes. Mind you, I wear gold tennis shoes all the time. They’re part of my brand, now. I’ve been recognized in book stores because of my shoes! 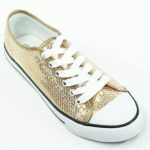 I have casual gold tennies that have a quilted pattern and gold beads for everyday wear, but for speeches, I wear my dressy gold tennis shoes that have rhinestones all over them. 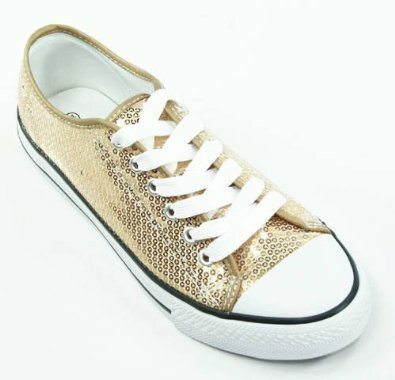 I even have gold beaded tennis shoes for black-tie events. I had thought briefly of wearing “real shoes” to this event, since this was a rather corporate environment, but then I decided just to stick with my usual style. He wasn’t buying it. “Don’t you have any other shoes?” he inquired. He paused for a long moment as he thought this over. It must have made sense to him, because he said, “Okay…but hurry!” He wanted me out of his jurisdiction as soon as possible, and I was happy to oblige him as I scurried upstairs to the meeting room. The meeting was fabulous with lots of great people—no one else in tennis shoes, I noted. (They must have been tipped off to the dress code.) They were all wearing those high-heeled pointy-toed instruments of torture the fashion industry insists on foisting on us—and we pay big bucks for them, too. This is different from ancient Chinese foot-binding—how? I gave up all my high-heels for Lent one year, and never took them back. Now I’m always comfortable. It made a big difference in my budget, too. The reactions to my gold shoes are always very interesting. Lots of people smile and comment how they just love my shoes, how comfortable they look, etc. I know these are My People. And of course, some people don’t like them—one woman told me after the talk that I should dress more professionally if I was going to talk about a serious subject like money. I just smiled, because that’s one of the problems I’m trying to solve—that people are too serious about money. Besides, I knew what she did for a living—she sold suits! So don’t judge me until you walk a mile in my gold tennis shoes.